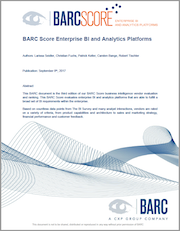 This BARC Score focuses on Enterprise BI Platforms that are able to fulfill a broad set of BI requirements within the enterprise. 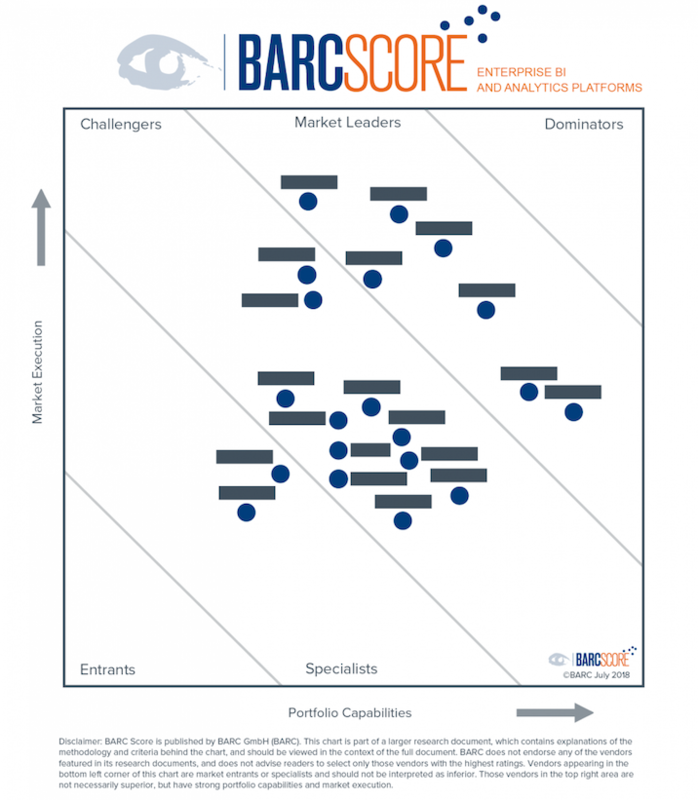 BARC Score analyzes the strengths and weaknesses of the major platform vendors in the BI market, as well as several smaller players that often have less visibility but still offer outstanding value to their customers. The market for business intelligence (BI) tools is highly competitive, with some large international incumbents, many successful vendors with a track record spanning decades, and countless smaller specialists with alternative and sometimes disruptive approaches to BI. This report analyzes the strengths and challenges of the leading vendors that offer beneficial value to customers wanting to implement a ‘modern’ enterprise BI platform. A modern enterprise BI and analytics platform is able to span traditional and explorative BI and analytics requirements both for standalone data and information applications but also when embedded in operational applications. With the increasing importance of data to not only support management decisions but also increase the efficiency and effectiveness of operational processes – as well as the growing number of products, services and business models being based on data – a modern enterprise BI platform is an indispensable backbone of any enterprise wanting to succeed in adapting to the digitalization of markets. A modern enterprise BI and analytics platform has to support a broad range of use cases. Therefore, it should provide front-end tools for different types of users based on a suitable infrastructural foundation. The technical infrastructure includes data warehouses and data marts, data integration and data quality components, dictionaries, repositories and many other technologies. Besides buying a modern enterprise BI and analytics platform, organizations should have a BI strategy that goes well beyond an architecture blueprint to include non-technical and emerging business user-oriented requirements, alignment with corporate strategy, organizational models, outcome-based priority settings and a proper roadmap. This document will help with the selection process by evaluating the most commonly used product sets from the major vendor community. Vendors with an open source business model are evaluated by their total revenue because they do not charge a license for their products, but an annual subscription fee.